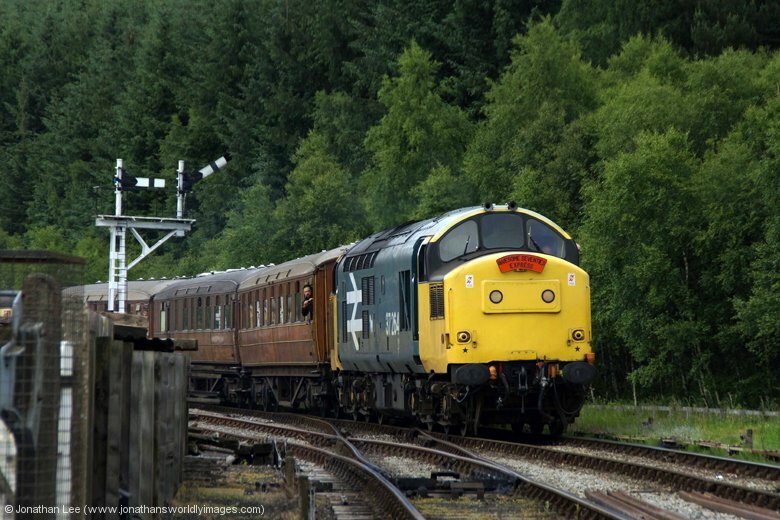 With all the hype about the North Yorkshire Moors Railway (NYMR) Diesel Gala there were great expectations while waiting for the loco roster to be published and personally I was looking forward to a good few days out with 31271, on a decent length line, with a decent load and with plenty of noise to boot! 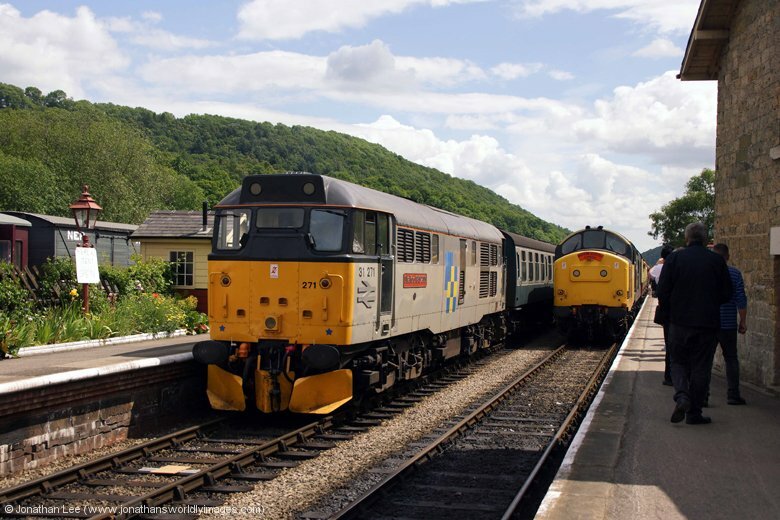 Once the initial timetable was published though it was unfortunately swung towards giving visitor 47596 and resident 37264 more work than anything else with both allocated to do as much as 31271, over the whole weekend, on Friday & Saturday alone. 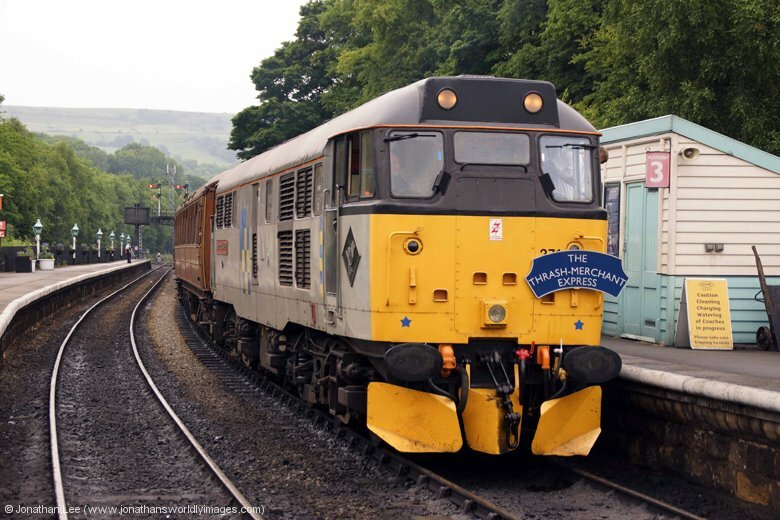 45060 seemed to have a bit of a bum deal as well; but all that was set to change only 24 hours before the gala commenced and all due to paperwork not being available, and not just for one loco either! 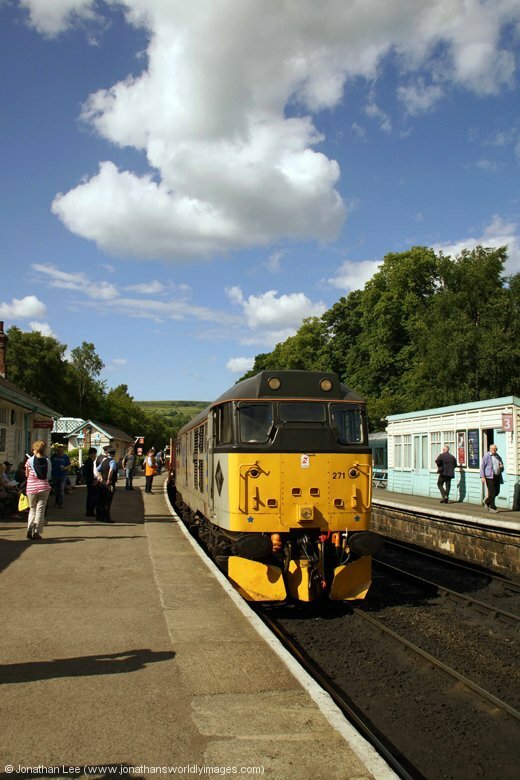 Some railways ask that air tank certificates be supplied to allow them to operate on their railway, the NYMR is one of these railways. To put that in context it’s not a requirement for main line running yet some main line operators do ask for air tank certificates if they are hauling preserved engines around the main line; e.g. 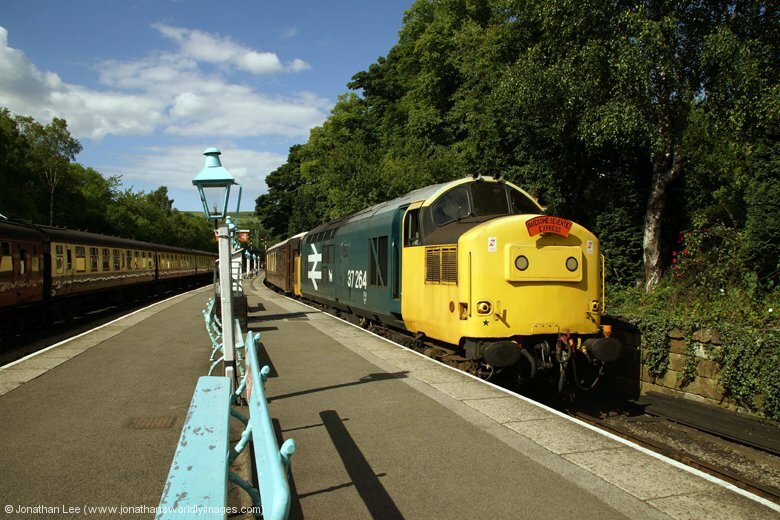 to or from a gala, which ironically in this instance wasn’t required by Devon & Cornwall Railways; who delivered the convoy to the NYMR with 56104. 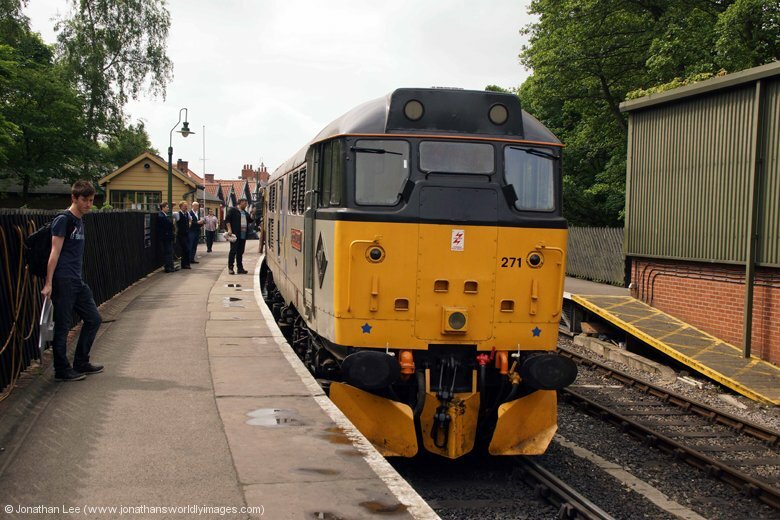 Both 20189 & 47596 became victims of no paperwork being available for their air tanks and as a result were not allowed to work at the NYMR; despite already being on site and in full working order. So late on Thursday night a new timetable was put together, and I have to say a far better one than the previous one, which saw the allocated work spread a bit more evenly between the locos yet still resident 37264 was allocated more work than anything else on the Friday with a whopping 4 return trips! 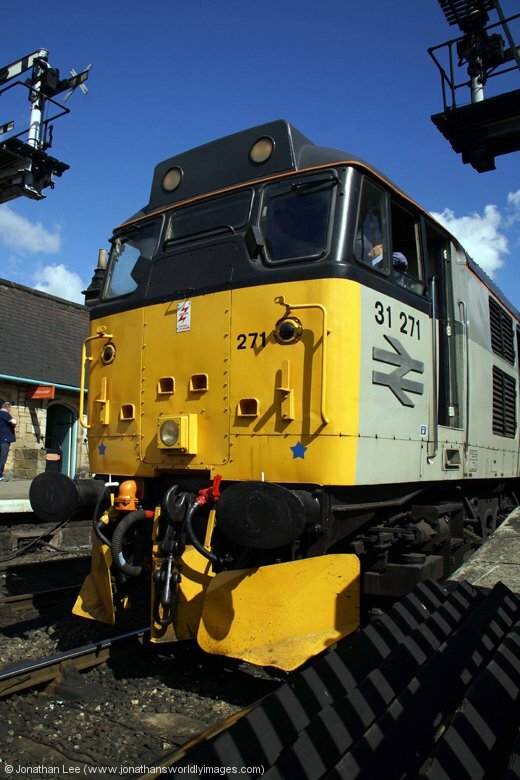 Still my interest was in 31271 and with three round trips on offer at over 100 miles my complaining about our allocation for the weekend ceased and I looked forward to actually getting there the following morning. With 31271 allocated to work the first train out of Grosmont to Pickering, at 0937, it was a pleasure to turn up and find it just coming off shed; while 25278 & a steam loco were just being marshalled around the Whitby set to depart at 0919. The station was almost deserted but the refreshment room was opened early for us and a decent breakfast was had before the festivities began. Unfortunately 31271’s first round trip was on a load 5 set which didn’t quite tax it enough up the hills but as always with 31271 it was a cracking return trip with plenty of noise to be had. 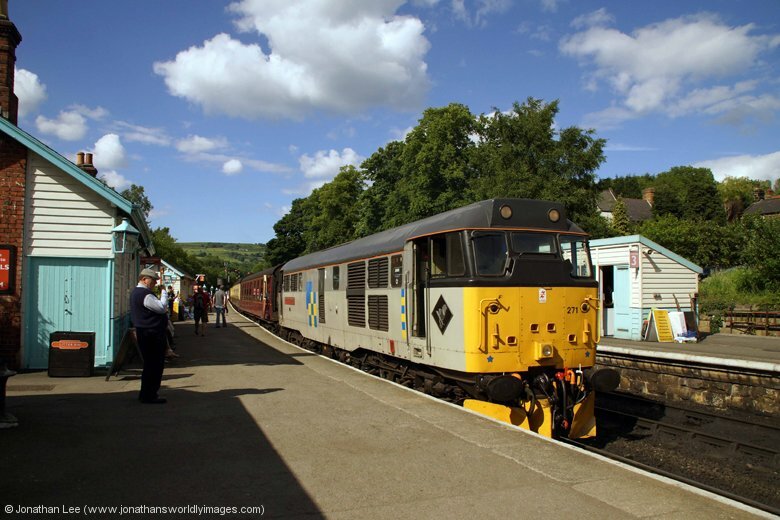 As it then had a lay-over at Grosmont of 89 minutes there was time for a fill-in move up the hill to Goathland on 37264; which was where things started to take a turn for the worst…..
With the set only being load 5 the run with 37264 up to Goathland was less than impressive with the driver not even bothering to play to the gallery. Upon arrival at Goathland 37264 was shut down and the signalman came out to tell everyone we would be here for a while; it was soon mentioned that there’d been a medical emergency on the 1209 Pickering – Grosmont and the train was still at Levisham waiting for an ambulance to arrive. Long story short one of the Peak bashers had been taken ill and was rushed off to hospital, to be released the following day thankfully. The result of the medical emergency was a bit of a mess though. 45060 turned up at Goathland with the 1209 from Pickering 90 late and 37264 continued on with the 1239 from Grosmont 90 late itself; both trains effectively about 30 late on the train behind’s path! 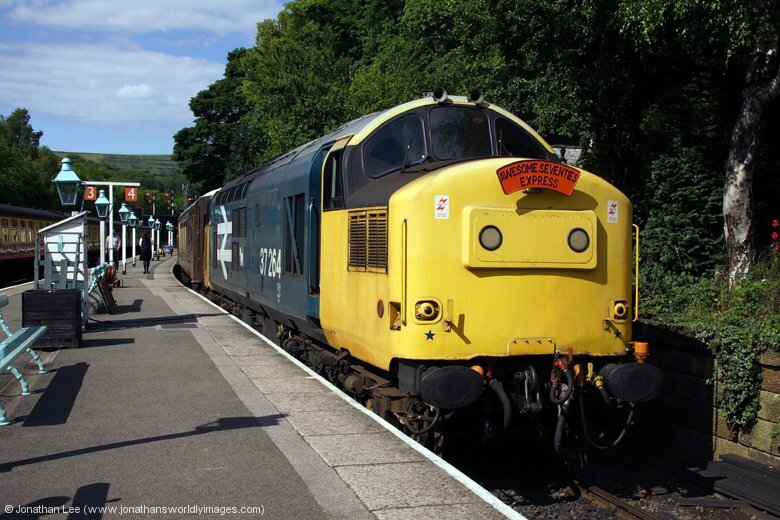 On arrival at Grosmont 45060 was run straight round to form the late running 1441 Grosmont – Pickering and 31271, which should have dropped onto the set to form the 1341 Grosmont – Pickering was left shut down in the station; the 1341 being caped! 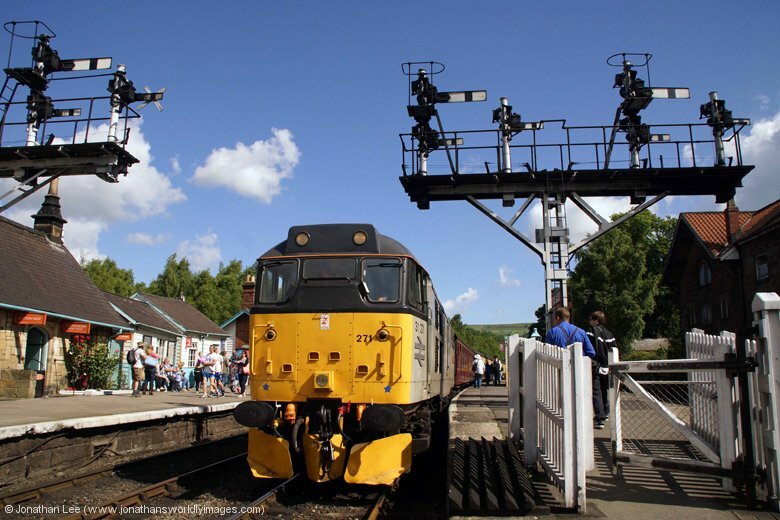 New from the control room, on the platform at Grosmont, was that both the 1409 & 1509 Pickering – Grosmont were caped along with the 1341 & 1539 Grosmont – Pickering, which meant that the next departure from Grosmont after the Peak had departed would be the 1635 Grosmont – Pickering, which 31271 should work anyway; after a return trip to Pickering in the mean time! 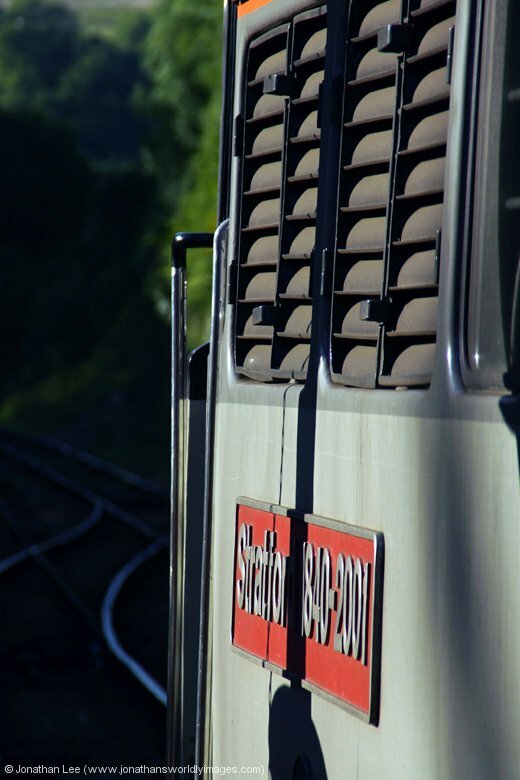 As a result of the delays both 31271 & 37264 lost a round trip of the line to allow things to be returned to normal. 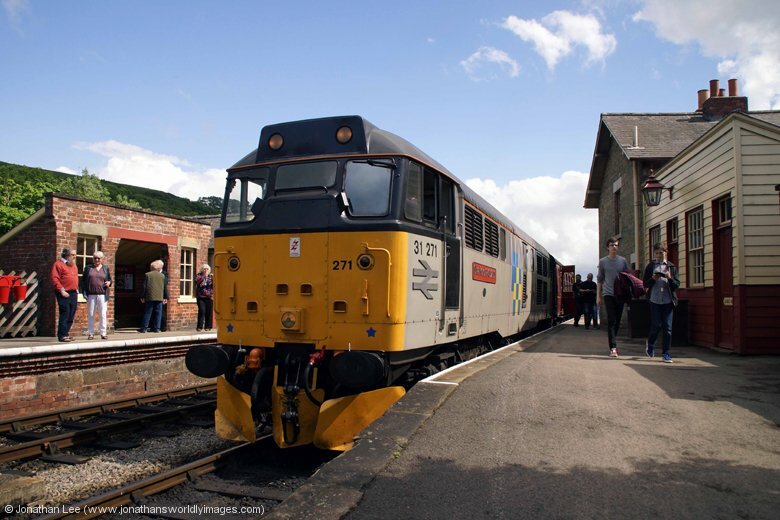 Thankfully a bit of common sense prevailed when 20142 arrived with the late running 1309 Pickering – Grosmont and an additional 1545 Grosmont – Goathland and return was run, with 31271 on the Goathland end and 20142 on the Grosmont end of the load 7 set. This returned from Goathland in the path of the cancelled 1509 Pickering – Grosmont and effectively order was restored when 31271 departed on the 1635 Grosmont – Pickering with 20142 remaining on the rear as dead weight; and a cracking slow and noisy run was had up to Goathland. 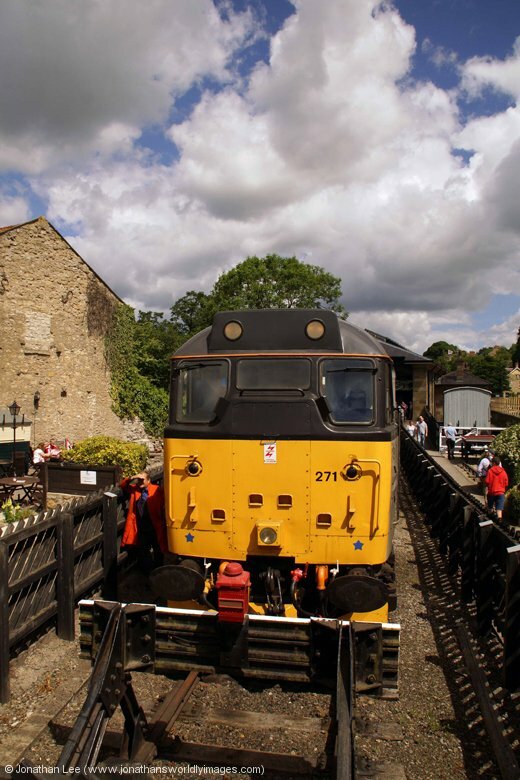 At Pickering 31271 ran round to top 20142 for the return journey and everyone was surprised to find the driver of the 20 do absolutely nothing until after Levisham, which allowed 31271 to do its stuff again on a big load; even after Levisham the 20 was only given a few notches and never got to full power at all! 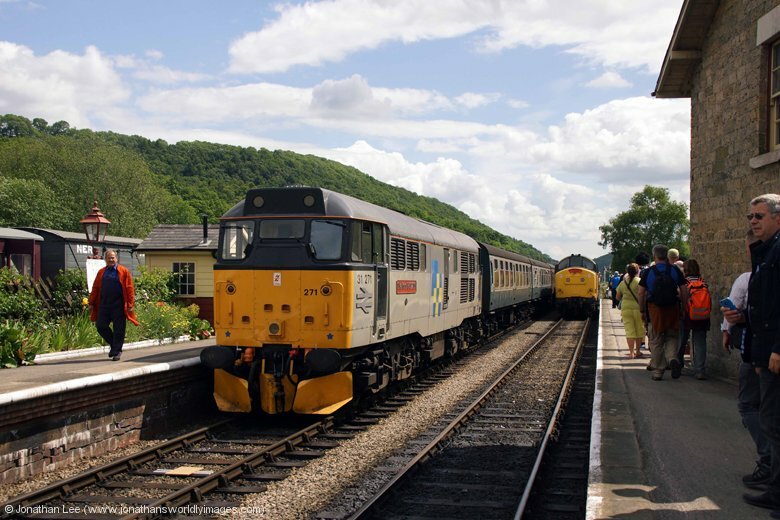 Despite the obvious problems and the unfortunate incident the day turned out ok and it wasn’t until we got back to Grosmont that evening that a new loco roster for Saturday 27th June became available; which again had 31271 doing 3 round trips; would it manage it the following day or would something else go wrong……? It was a later start on the Saturday morning for 31271 and the last parking space in the car park at Grosmont sufficed nicely as we arrived well ahead of 45060 and the 0859 Pickering – Grosmont; which we’d seen coming through the valley while coming over the top. All seemed to be well and 31271’s first return trip was completed without incident and the bonus of it being that we would have the load 7 set all day. The middle trip of the day was rostered to be with 20142 in tandem but to make the NYMR’s life easier 31271 wasn’t run round at Grosmont on arrival with the 1159 Pickering – Grosmont; instead it was left on the back of the set and 20142 dropped onto the other end for the 1334 Grosmont – Pickering. 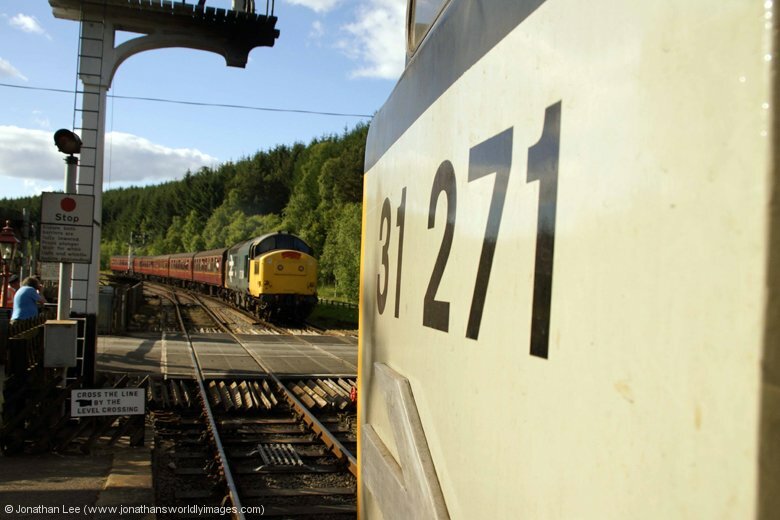 This being less than ideal from a 31 basher’s perspective but it was what it was but with 20142 not being up to the job 31271 was used to assist in rear up to Goathland but not as much for the rest of the journey; mainly where needed. 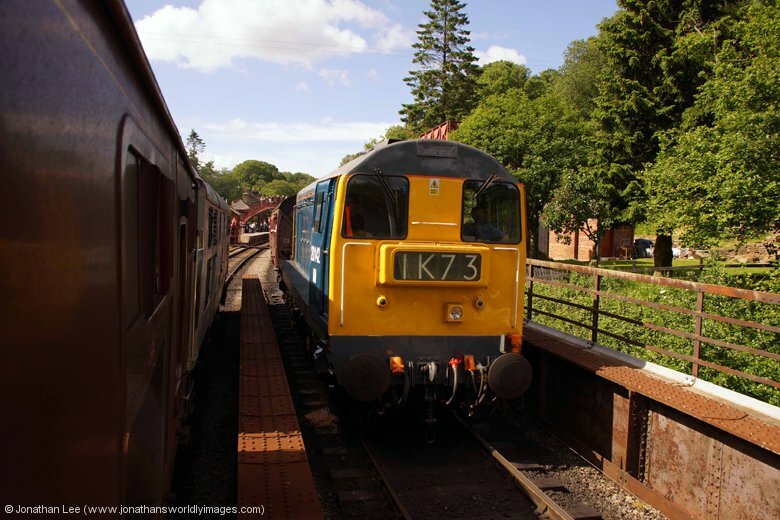 Thankfully 20142 was left on the rear of the 1504 Pickering – Grosmont, which gave 31271 a decent load to get to grips with going back uphill on the return and a good journey was had by all. The final return trip of the day was going swimmingly and on the return trip from Pickering the day looked set to end without incident when 31271 rolled into Goathland, bang on time, with the 1759 Pickering – Grosmont; it was just too good to be true though and it degenerated into a farce from that moment onwards. 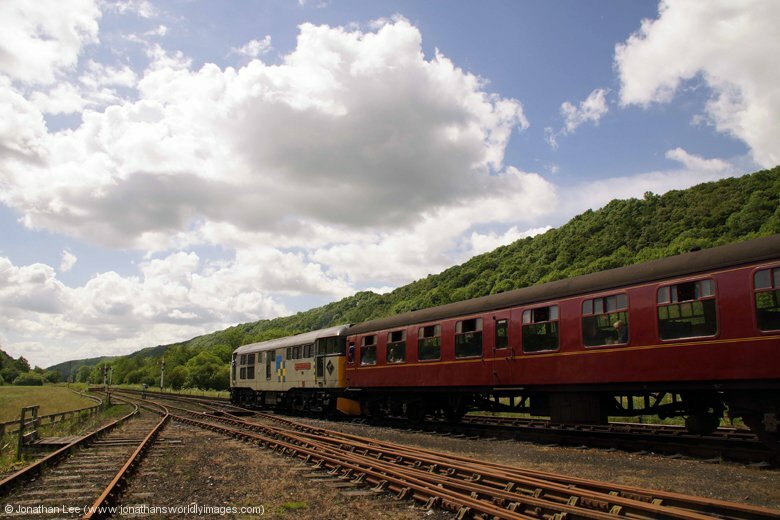 Initially we were only told that there was an issue at Grosmont and the driver of our train was needed there to work the train that we should have been passing at Goathland from Grosmont! As all the platforms at Grosmont were full the only way they could get 31271 to shed and the driver onto the other train was to cape our train, propel it into the loop at Goathland and send 31271 light to Grosmont; the result of that being a passenger count being done to allow taxi’s to be ordered to get folk back to Grosmont. Having been stood on the platform for 10 minutes it then transpired that an alternative crew had been found and our train was reinstated; the issue then being we’d have to wait for both the 1841 & 1915 departures from Grosmont to get to Goathland before we’d be allowed down the hill! 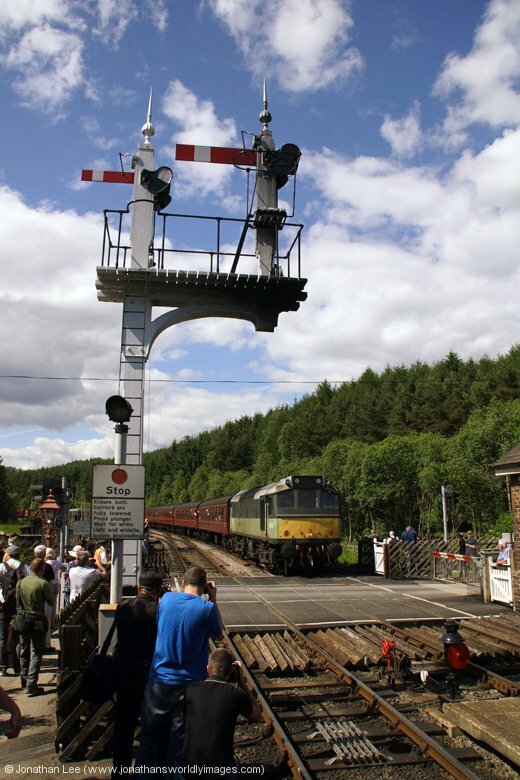 This ultimately made us over 60 late and the two trains ran with the 1915 Grosmont – Pickering steam diner in front of the 1859 Grosmont – Pickering beerex; formed of 45060. 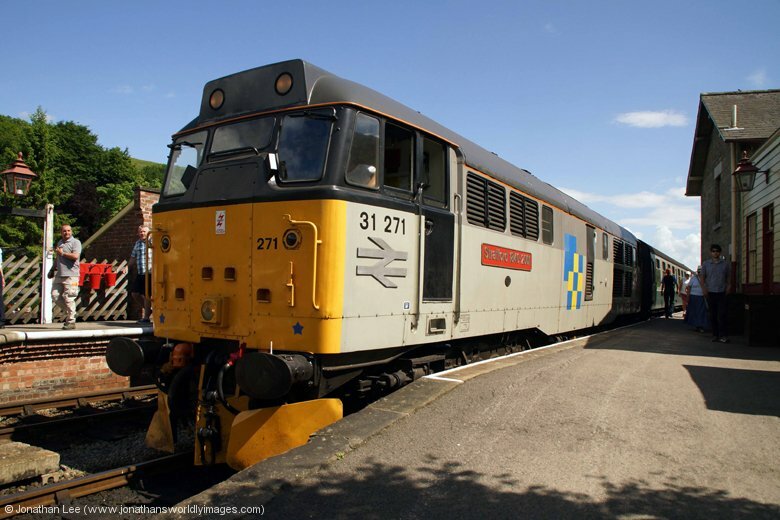 Having managed to extract a timetable from the control room at Grosmont prior to departing the previous night it was only the fact that 31271’s diagram had been changed that enticed me along; the 2 hour earlier finish was the clincher! Upon arrival at Grosmont it was evident that something wasn’t quite right when 25278 was just departing with the 0859 Grosmont – Whitby without 20142 on the rear; which was still shut down in the sidings as we passed by the shed with 31271 heading the 0929 Grosmont – Pickering on the load 7 set again. At Goathland we were held for 20 minutes to await the 0859 Pickering – Grosmont to arrive which did so with 37264 vice 45060; which according to hearsay had failed at Pickering. 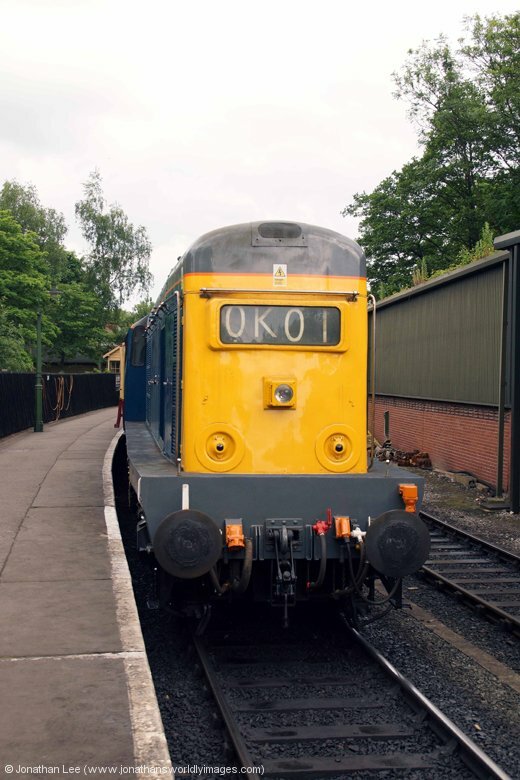 It turned out that the Peak apparently had some issues with a brake cylinder, which could have been the reason for both its buffer stop and SPAD incidents the previous evening and it was being assessed at Pickering before working a train that morning. Ultimately we passed it at Levisham with the 0959 Pickering – Grosmont; which 37264 should have worked. We were told it was going to Grosmont shed on arrival to have a proper inspection and when we passed 20142 at Goathland on our return trip from Pickering, working the 1133 Grosmont – Pickering vice 45060, which had obviously been vice 37264 initially, it was no surprise when we found the Peak was shut down on shed and scotched at Grosmont; it was end of day and gala for 45060. 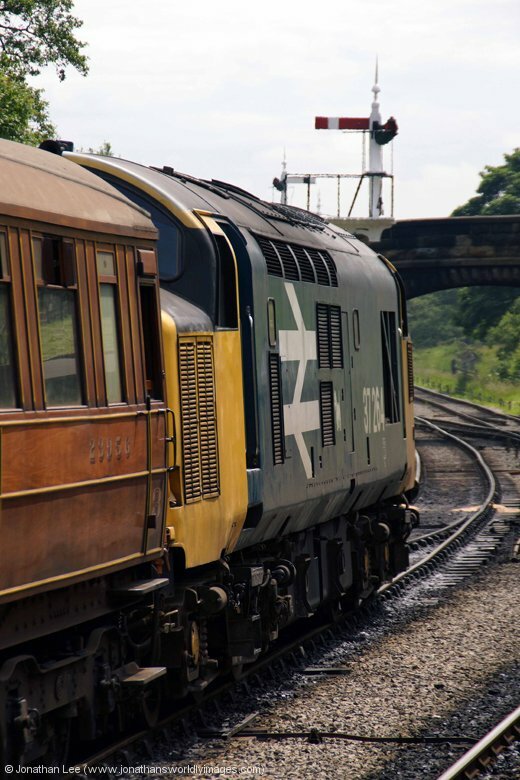 20142 remained out vice 45060 and eventually got back into the Peak’s booked slot that afternoon on the 1541 Grosmont – Pickering while 37264 was shunted back to its original diagram also. 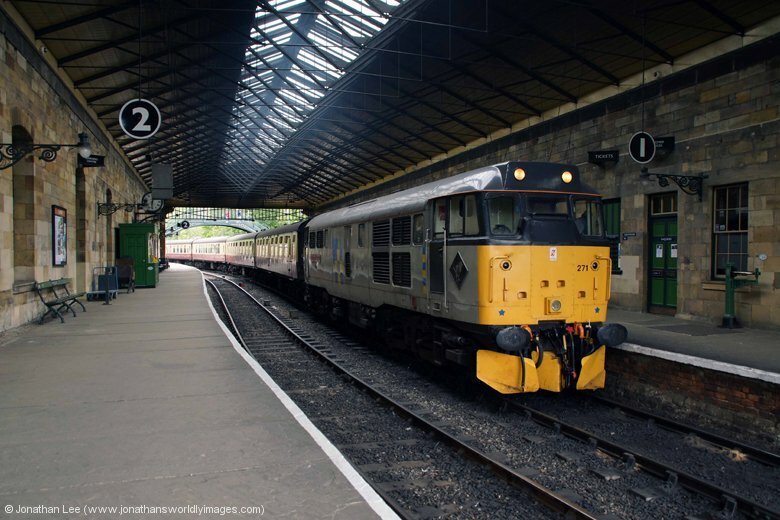 The lack of engines for the day resulted in the 1150 Whitby – Goathland and 1311 Goathland – Whitby being cancelled as the NYMR couldn’t run round at Whitby in the 5 minutes allowed. Ironically the only loco that worked as advertised all day was 31271, which worked its two round trips on load 7 sets without issue and provided plenty of entertainment on what turned out to be a rather pleasant day in the end; a good end to a decent gala but not for all of course, some getting an earlier bath than others and of course some didn’t even manage to start in the first place….. 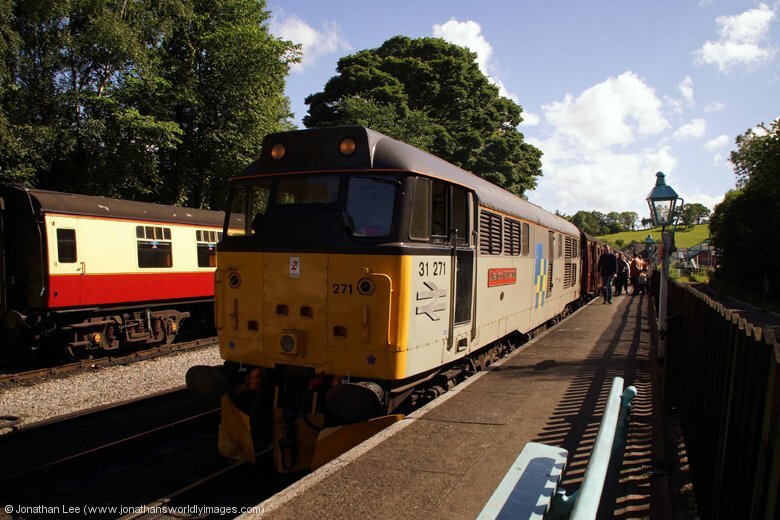 It hadn’t been the best of galas for the NYMR at all but trains had still been busy enough at times. 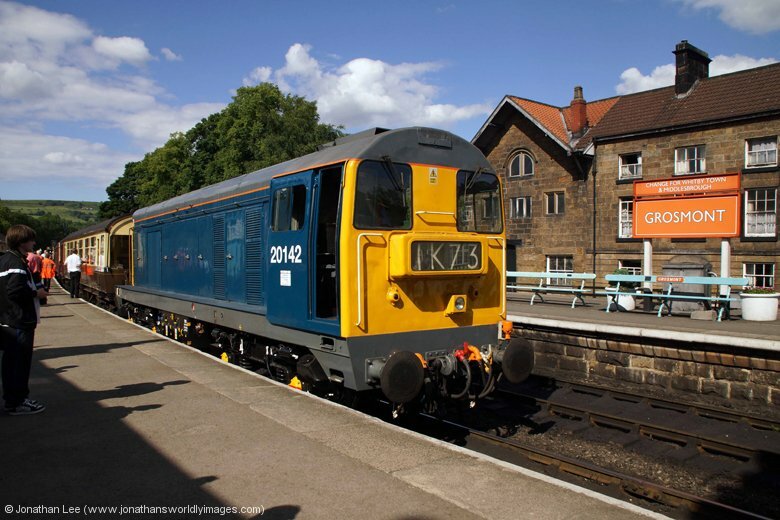 Not only had the NYMR probably learnt a few lessons the whole of railway preservation had probably learnt quite a bit off the back of the issues faced over the weekend; especially surrounding air tanks and paperwork! 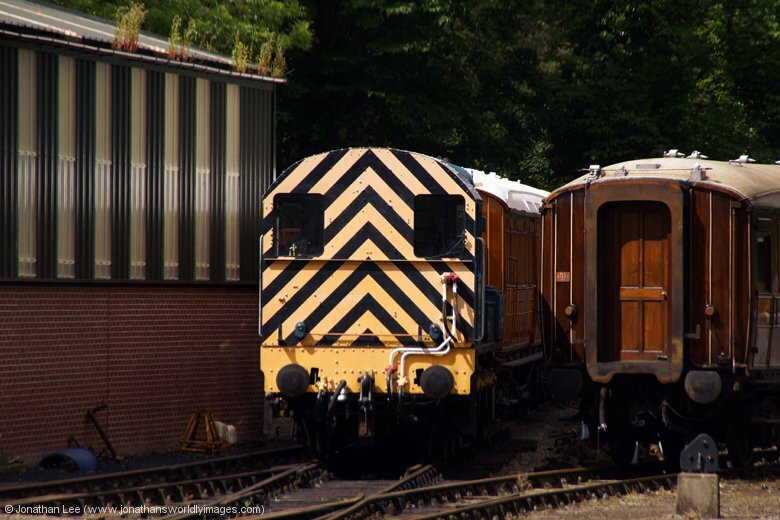 However I’m sure it wouldn’t be the last farce at the Moors and I’m also sure it won’t be the last paperwork related issue surrounding a preserved loco working at a non-resident railway; happy days……..